This week was a long one, to say the least. On Friday, my partner and I were assigned to what we thought was a compelling story about how light pollution can affect military night training operations. We were promised access to both Whiteman Air Force Base and Fort Leonard Wood, and we were really excited to get so close to the action and do some real reporting. We spent all day Friday, part of the weekend, and all day Monday contacting sources and lining up interviews. Then, Tuesday came. And everything fell apart. Our sources, seemingly all at once, backed out on us. They gave a myriad of excuses and apologies, but it didn’t make us feel any better. It was Tuesday afternoon, our story was due in 48 hours, and we had nothing. We spent a good couple of hours brainstorming with our professor, and eventually we decided on a story idea. It was weak, but it was something. We were told it was a “teaching moment,” and that we were to do our best to create the best story with whatever we could find. We knew the new members of Mizzou ’39 had been announced a few days before, so we set out to find one of the recipients with an interesting story and profile them. After placing a few calls, we found a student named Dolores Obregon. Based on the initial information we gathered sounded marginally interesting, but we didn’t have our hopes up. Well, it turns out that Dolores has an absolutely fascinating story, and I was lucky enough to have the privilege of telling it. Dolores Obregon (right) talks to fellow magazine journalism student and Mizzou ’39 award recipient Stefanie Kienstra Wednesday, Feb. 24, 2010 at Mizzou Arena. 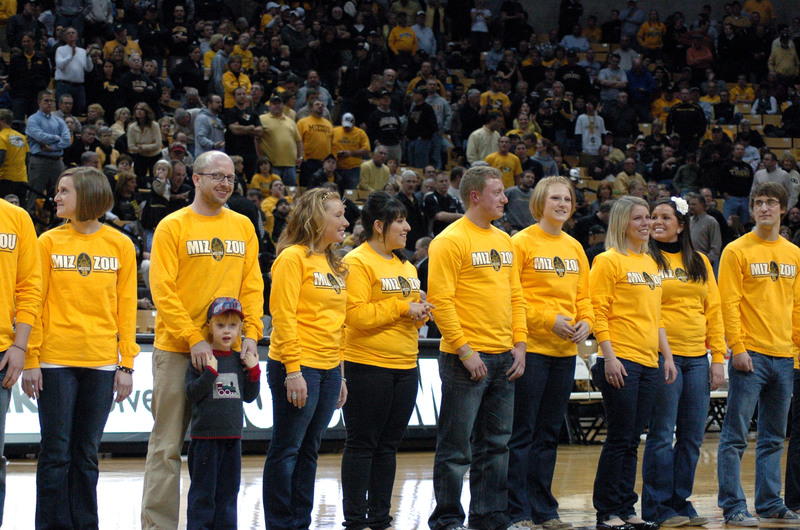 Obregon and Kienstra, along with 37 other award recipients, were recognized at halftime of the MU-Colorado basketball game. Dolores Obregon will never forget what her father’s feet looked like. Obregon was four years old the day her father was shot and killed in San Antonio, Texas. As she recounted this story, she did not cry. She simply stared straight ahead, focused. Her brown eyes were soft, but behind them lay the intensity that has driven her for the past 18 years. That intensity is what brought her from Texas to Missouri. She set out on a journey to prove that someone who comes from nothing can become something. Now, just three months from graduation, Obregon is being recognized for all the things she accomplished on that journey. Obregon, 22, is one of 39 seniors at MU to receive the Mizzou ’39 award, given to those who excel in three categories: academic excellence, community involvement and service, and leadership and involvement on campus. Six years ago, members of the MU Alumni Association Student Board created the award in an attempt to reach out to an underappreciated campus population. “We realized Mizzou didn’t really have an award that just recognized seniors,” said Carrie Bien, coordinator of student programs for the Mizzou Alumni Association. Several Mizzou ’39 award recipients stand on the Mizzou Arena court during halftime of the MU-Colorado basketball game Wednesday, Feb. 24, 2010. Recipients were publicly revealed at a ceremony in Jesse Hall Sunday, Feb. 21 and will attend a banquet at the Reynolds Alumni Center Friday, Feb. 26. Bien said students apply for the award for many reasons and come from very diverse backgrounds. Obregon said she applied because she wanted to be an inspiration to younger family members. Obregon, who was selected out of a pool of 144 applicants, was recognized for her involvement in campus organizations like Mortar Board as well as her service with Centro Latino, a community organization that works with less fortunate children of Columbia’s Latin population. She says she sees children every day who remind her of herself as a child, and that is what pushes her to give back to them and to the community. The first member of her family to go to college, Obregon said she never anticipated being where she is today. However, Obregon’s mother had no doubt her daughter was college-bound. Even when Obregon was sick she still demanded to go to school, and her mother knew it was useless to fight her. Obregon loved school for another reason, though. After her father died her mother fell into depression and began taking anxiety medication. To avoid seeing her mother in pain, Obregon took refuge at school. Aside from the grief, there was another barrier to Obregon’s success. After her father died, her family fell into poverty. Living off welfare and Medicaid, Ramirez tried to create the best life possible for her family. “She would always pawn all of her jewelry before every holiday so she could buy a few things,” Obregon said. Though she lived her entire childhood in poverty, Obregon said she never knew she was poor. Instead, she believed the experience of her youth was just like every other child’s. It wasn’t until high school that Obregon began to realize she was different. She started to want for some of the luxuries other students had, and realized her mother couldn’t afford them. Because of her financial situation, Obregon knew she would have to find a scholarship to help her get to college. From the outset, she had a few things going for her. Between second and sixth grade, she was recognized by Duke University as one of the nation’s top students based on her IQ and test scores. She also won the Princeton Book Award and was selected as a student listed for the Who’s Who Among American High School Students two years in a row. Obregon’s high school counselor recognized her exceptional accomplishments and encouraged her to apply for the Gates Millennium Scholars program, which is sponsored by the Bill and Melinda Gates Foundation. The program, which awards 1,000 scholarships to low-income students each year, is the largest minority scholarship program in the country. Obregon filled out the application, which included at least 10 essays and took her more than a week to complete, and was selected as an award recipient. The award gave Obregon a full scholarship to MU, covering her tuition, room and board, and books, as well as providing her with a stipend. Money, however, didn’t cure all of Obregon’s problems. During her freshman year, she was a victim of racism. There were several incidents involving three other females on her floor, one of which was particularly blunt. Obregon was particularly hurt because she was being criticized for something she couldn’t change. Obregon’s dreams now include some ambitious post-graduation plans. She hopes to be accepted as part of the Teach for American program so she can return to the San Antonio area. She plans to use the experience as research for a project she has been planning for a few years. “My goal is to own my own magazine aimed at helping low income or less fortunate children go to college,” Obregon said. Obregon plans to graduate in May, and has a wedding date set for July with her fiancé Spencer Ramirez, an aircraft inspector in San Antonio. The couple just finished construction on a house in San Antonio, and Obregon said she is thrilled to start a new, simpler chapter in her life. It is clear Obregon is proud of how far she has come, but according to Ramirez, the approval of her father means the most.